being some numbers and is given by the zeros of some Bessel functions. This last result seems quite different from mine that I get explicitly but this is not so because, in the asymptotic regime, and zeros for the cosine go like and then, my spectrum is easily recovered in the right limit. The right limit is properly identified by Sasha Migdal from Padè approximants for the propagator that start from the deep Euclidean region , being an arbitrary energy scale entering into the spectrum. So, the agreement between the scenario proposed by these authors and mine is practically perfect, notwithstanding different mathematical approaches are used. The beauty of these conclusions is that such a scenario for a Yang-Mills theory is completely unexpected but it is what is needed to grant confinement. So, the conclusion about the questions of mass gap and confinement is approaching. As usual, we hope that the community will face these matters as soon as possible making them an important part of our fundamental knowledge. The great news for me, in this week, has been the acceptance of my paper of QCD at finite temperature in Physical Review C (see here). This chance materialized after the excellent work of the referee that helped me to improve the paper in a significant way. For a good paper, such a way to review is a fundamental one and should be a rule. I have discussed this paper previously in my blog (see here and here) and I presented its content in a conference in Paris this year (see here). The contribution to proceedings is this. I think that the main conclusions of this paper that should be emphasized is that the low-energy limit of QCD is a non-local Nambu-Jona-Lasinio model, a critical point exists at finite temperature with zero mass and zero chemical potential and that the instanton liquid picture of the vacuum of QCD is a very good one. These are fundamental questions in QCD that were waiting for an answer for so long. I would like to thank all the people that, with their efforts and interest about my work, helped me to get these results published, in the end, in such an important journal. A couple of fundamental great news, well one is just a rumor, is hitting scientific community today. Now, the most promising region seems to be at high mass but we are always around . The great news here, but it is an uncontrolled rumor, is given at Jester’s blog: Also with no excess greater than is seen in the low mass region! Standard model Higgs seems to be ruled out and the physics here is somewhat different. My view is that if it is proven true that such a scalar particle exists and has a high mass, something unacceptable so far for the standard model, also supersymmetry will be proven true (see here). OPERA Collaboration confirmed their measurements on the speed of neutrinos. This is a major breakthrough in physics and a new version of their preprint is appeared on arXiv today (see here). This will soon be published on JHEP. So, no more discussions whatsoever but the last word is left to other independent measurements. This is really a breaking news for physics and my personal view is that this should represent a first example of a measurement that could have some impact in the area of quantum gravity. For a fine account, as usual, you can read here. These are the promises for exciting time ahead. Stay tuned! Update: Dennis Overbye commented on OPERA new results on New York Times (see here). A few comments from reputable scientists are worth reading. The end of this year is approaching, LHC gathered data at higher luminosity but it is since the end of August that no news is around about the status of the search of the Higgs particle. Of course, a frenzy of activity is going around at CERN and finally, something seems to move. On Monday a new conference will begin in Paris (see here). No relevant novelties are expected with respect to this talk but DG of CERN asked for updates in the mid of December (see here for other information). Besides, rumors are spreading around blogosphere that a group at CERN asked at the conference organizers a further slot to give an announcement. All this is giving the flavor that, for the end of this year, some relevant news about Higgs will come out. It could be possibly a matter of days. I would like to resume here the situation. Latest measurements seem to exclude a standard model Higgs for almost all the range from the LEP limit of 114 GeV to near 600 GeV. At about 600 GeV ATLAS is seeing an excess. Similarly, it is possible that Higgs particle is hiding at around 140 GeV but all the excesses seen so far are no more high than so that, a no Higgs scenario is gaining support. Tevatron appears to confirm this situation. 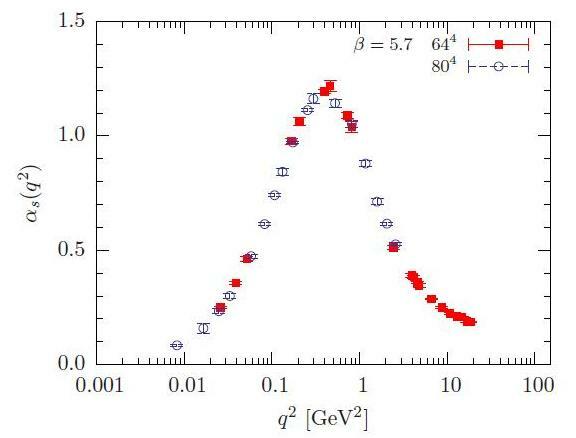 The excess at 600 GeV, if confirmed, will imply a relevant re-analysis of the standard model as, in this case, we will enter into the realm of a strongly coupled quantum field theory. I provided mathematics for this (see here and here) but it is not widely accepted by the scientific community and, in general, other methods to work with this case are not known and most of our understanding relies on lattice computations. 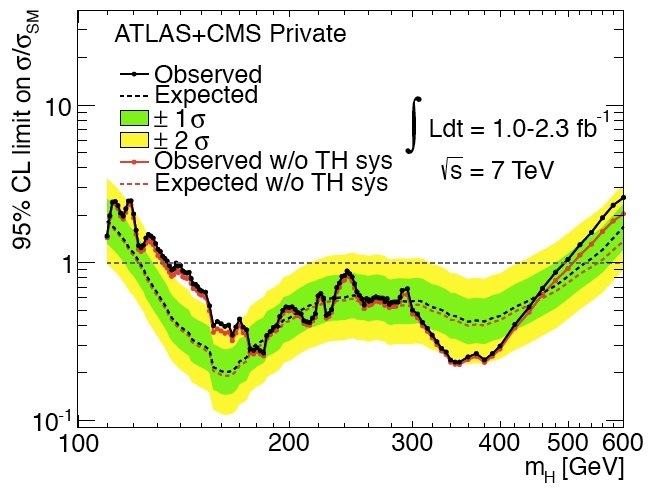 A heavy Higgs has also been forecast by Paolo Cea and Leonardo Cosmai (see here and here) having approximately the mass near the ATLAS excess. This would make the situation quite dramatic but really exciting and will provide a strong evidence for the existence of supersymmetry. Besides, in this case, a whole spectrum of excited states of this heavy and strongly coupled Higgs will also be observed. In view of this near approaching dates, we wish the best of luck to people at CERN and thank them for their excellent work. I had the chance to meet Federico in a series of conferences organized by Rodolfo Bonifacio of University of Milan at Gargnano on Garda Lake. The last time I met him was on September 2003 at this conference. Federico is the one on the left. Federico was an associate professor at University of Milan, an expert in quantum optics, and it was a real pleasure to have the chance to share some time with him. 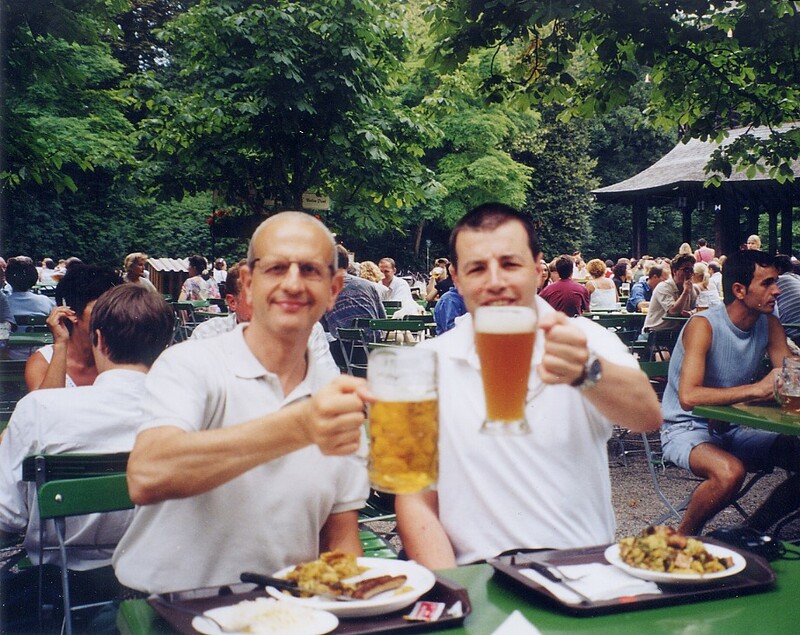 Federico was a nice and competent person and we have had several discussions with a good beer there in Gargnano. When conference gave a break, with Federico and a colleague of INFN we took his car and went to the highest point around the lake to see a breathtaking landscape. That day we had a lot of interesting discussions that signed the start of a friendship that lasted until he let me know he was ill and was retiring. Federico was instrumental in my work helping me to recover material otherwise unreachable. We have had a constant exchange of emails in these years and was my pleasure to make him compliments for his preferred team, Internazionale (Inter), that was winning all. Now I am getting emotional for this bad news. He left us on May for a very bad illness and I should say that I feel that someone important in my life is missing. He will be remembered for his work, the kindness and the competence. He is survived by his wife. This picture gives a blatant evidence of the scenario I was able to obtain mathematically and that is consistent with the mathematical proof given in Dynin’s paper. On the other side, the spectrum is the one of a harmonic oscillator at lower energies. This means that, at lower energies. a Yukawa propagator should fit the bill rather well and a plateau must be observed from lattice computations. This is indeed the real situation (see here for a recent review). To support further this scenario, the ghost propagator is the one of a free particle in the same limit. This shows again that the theory is infrared free. So, there is a situation, both from a mathematical side and a physical one clearly showing an explicit solution to the Yang-Mills question and that should be addressed rapidly. Of course, behind all this, there is a lot of work of very good people that moved our knowledge to the present point and that is cited in the papers I presented here. It is my view that, whatever would be any other contribution to this research area, the acquired scenario is the one I described above as strongly emerged from lattice computations. My hope is that this will become part of our knowledge in a reasonable time. You are currently browsing the The Gauge Connection blog archives for November, 2011.